Marvel at the fiery red skies as they shine off of the water and the downtown skyline as you sail through the bay. You and your sweetheart are sure to feel the romance as you sip on your choice of white wine or champagne. This is a private sail with a captain, you will feel secluded on the water while you enjoy the scenic tour. If you choose to leave from our Downtown location you will be in the heart of San Diego Bay. 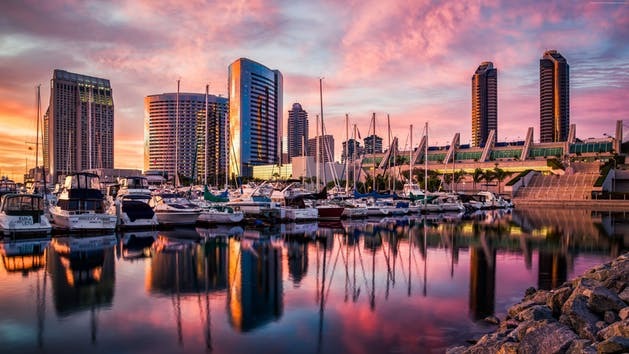 Located in the Marriott Marina next to Seaport Village there is so much to see on your tour of the bay. The Midway Museum Naval Ship is located close by, marvel at its immense size as you cruise right underneath its massive hull. Then sail down to south bay under the Coronado Bridge and into the wide open spaces by the silver strand beach. Our Coronado Island location is a popular departure spot as it is located next to a seafood restaurant and the Coronado Golf Course. Cruise through the marina and explore the many yachts that call Glorietta Bay home. Once you leave the marina you will be directly under the Coronado Bridge, an iconic spot for taking your couples photo! 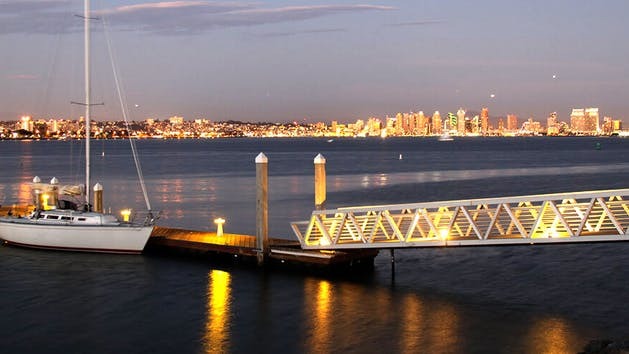 Sail through the expansive waters of the bay and enjoy the sights of the San Diego skyline. Harbor Island is a conveniently located departure spot as it is right across the street from the airport. Take the opportunity to marvel in one last San Diego sunset before you hop on a plane back home. This location also offers you views that you won’t see from the other locations if you sail towards the mouth of the bay that opens to the ocean. Cruise past the steep hillsides of Point Loma and get dropped off at nearby restaurants to keep the party going! Mission Bay has it’s own charm as it is the only true recreational bay in San Diego. The relaxed and “lake-like” atmosphere appeal to those who wish to cruise through its many marinas and beachfront properties. Many wind surfers and water sport activities can be marveled at while you speed through the calm waters of the bay. The local wildlife is in abundance in Mission Bay, and you can get up close and personal with sea lions and dolphins. This is also the most ideal location to leave from if you would like to hit the open ocean with uninterrupted views of the sky meeting the water.